No matter if you feel the whole djent thing or not, this is a killer rock guitar for shredders, metalheads and fusion buffs. Flawless construction and playability. Razor-sharp tones from the MBK pickups. While British guitar maker Manson has had its reputation boosted in recent years thanks to its association with Muse guitarist Matt Bellamy, its latest models are designed to put a smile on the chops of practitioners of something called 'djent'. Into this theatre of genre conflict strides our newly arrived E-Series Manson guitar: the six-string E-62. The example that you can see in the pretty pictures on these pages is the first prototype production model. By the time you get your hands on it, the tuner buttons will be smaller to suit the Lilliputian scale of the headstock). In all other respects, however, it is exactly as it will be in full production guise. There are two six-string models available. There's the E-61, which comes loaded with your choice of Seymour Duncan or active EMG pickups for a price tag of £1,699; and our E-62 (£1,999), equipped with Bare Knuckle-made Manson units. The E-62 also comes with upgraded CTS potentiometers and Sprague Orange Drop capacitors. All models are shipped with a custom Hiscox LiteFlite case. 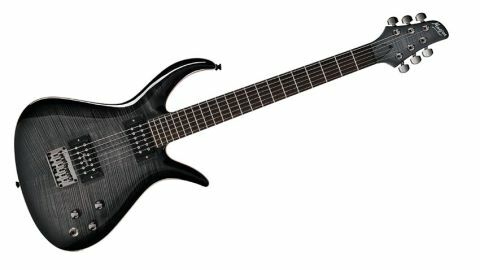 You can also splash out another £325 and spec either of the six-strings with a Graph Tech piezo system for acoustic tones. "The E-62 employs a neck-through-body construction, meaning the five-piece maple and mahogany layer cake that is the neck runs the entire length of the guitar"
The E-62 employs a neck-through-body construction. For the uninitiated, this means the five-piece maple and mahogany layer cake that is the neck runs the entire length of the guitar: from the tip of the headstock to the bottom-bout strap button. During the construction of this guitar, a pair of mahogany 'wings' are glued on - one either side of the extended neck - to form the body shape. The whole affair is then topped off with a two-piece bookmatched flamed maple cap to provide some top-end sizzle, and make the guitar look pretty. Once the glue dries, someone at the Czech factory gives the body and its slim-profile neck a good seeing-to with a spray gun. While some djentlemen may prefer blonde, in this case they'll have to settle for one of two available polyester finishes: High-Gloss Black or Red Sea 'Burst. The former (as seen here) couldn't be better applied if they'd put Michelangelo on the job. It has that 'just dipped in molten glass' vibe. All E-Series models feature a snappy Fender-like 648mm (25.5-inch) scale length and a 305 to 406mm (12- to 16-inch) compound fingerboard radius. That's like a Les Paul at the bottom of the 'board; more like an Ibanez Jem at the top. Thus, fretting chords over the first few frets is comfortable, while you can bend forever further up the neck - even with a very low action. Great playability is further assured thanks to the 22 beautifully dressed and seated jumbo frets on both of our test instruments. All that translates to a guitar that can pull off razor- sharp chugging rhythm and flab-free bottom string riffs, yet clean up for convincing neck- pickup jazz tones, making the E-62 less like a genre-specific metal machine and more like a great all-rounder. Tim Mills has a knack of making passive pickups with the power and clarity of active units without compromising warmth on clean settings. That beautifully executed tonal balance sums up the qualities of this wonderful guitar. The E-62 is supremely executed. Whoever is building and finishing the bodies and necks over in the Czech Republic definitely deserved their Christmas bonus this year, and the finishing touches performed at Manson make it just that bit easier to justify parting with the business end of two grand.